Rushabh decided to quit his job in April 2014 and started working as a Freelancer. He developed a windows app and he decided to sell it via his website. He hoped people across the world would purchase and download his application. Rushabh launched his app in Feb 2015 and it went viral. People who purchased his app in India, paid using an Indian Payment Gateway called ‘Superfast’. People purchasing his app from outside India used a foreign Payment Gateway. Both payment gateways charge 4% as commission fees. The total charged to Rushabh by the gateways is Rs. 24,000 as commission fees. Rushabh’s earnings in 2014-15 from sales of his app were ~Rs. 6,80,000. Out of that, the portion of the revenue from India was ~Rs. 2,80,000 and the portion of the revenue from outside India was ~Rs. 4,00,000. 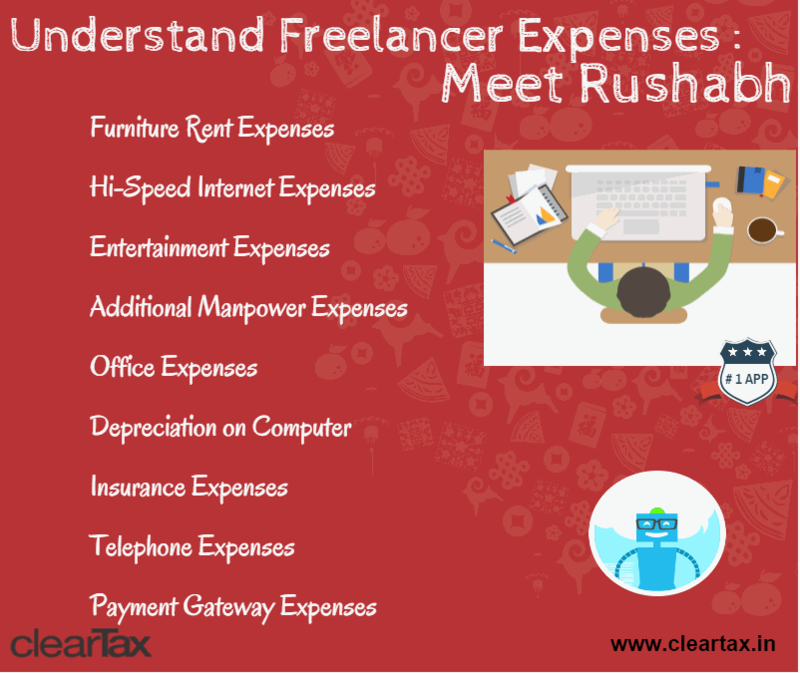 Rushabh is now confused about how he should go about figuring out his Freelancing Expenses. Rushabh’s total revenue from his app is Rs 6,80,000. Since he is a freelancer he is allowed to deduct expenses from his revenue. Rushabh starts to list down all the expenses which are directly related to this app revenue. Rushabh took high speed internet services which cost him Rs 1,000 per month. Total Internet Costs = Rs 12,000. Also payment gateway commission of Rs 24,000 shall be included. So with the information Rushabh gave, this is the detail of his Income from Business/Profession or simply the Income of his Freelancing work. Below his ‘Net Profit’ or ‘Freelancing Income’ is also calculated which is Rs 5,17,400 for the financial year 2014-15. Income from Salaries – This includes any income of salary or other payments received by virtue of an employment. Rushabh’s one month’s salary of Rs 52,000 was credited to his account and PF of Rs 1,200 and TDS of Rs 2,000 was also deducted before he quit his job at the end of April 2014. Income from House Property – Rushabh owns a one bedroom apartment and has given it on rent to 2 students who pay him Rs 15,000 in total. He also paid property tax of Rs 15,000 to the local authorities. From total rental income from the house, property tax paid is allowed to be deducted. Additionally a standard deduction of 30% is allowed on the net house property income (after deducting property tax paid). To understand how income from house property is calculated – read our detailed guide page here. Income from Freelancing or Business & Profession – Income from freelancing (business or profession) as calculated in our last post is Rs 5,17,400 for Rushabh. Income from Capital Gains – income from sale of a capital asset. Rushabh did not sell any capital asset in the financial year 2014-15. Income from Other Sources – Income from interest on savings account, interest from fixed deposits – this is the residual head of income, incomes which cannot be taxed under any other head of income are taxed here. Rushabh has a fixed deposit on which he earned an interest of Rs 12,000. Additional he earned an interest of Rs 7,800 on his savings account. 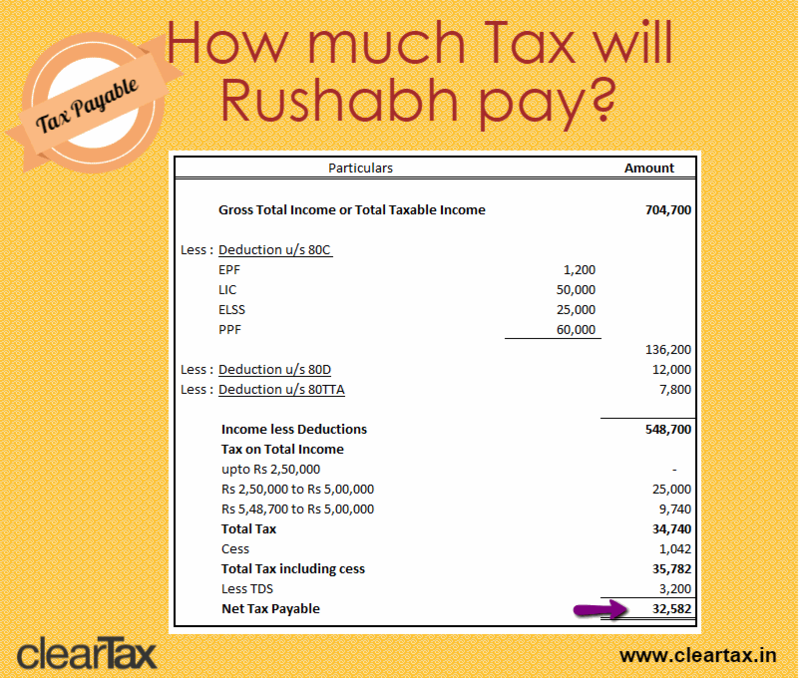 With the details received from Rushabh – this is how his Total Taxable Income is calculated. Total Taxable Income of Rushabh is Rs 704,700. Now, let’s help Rushabh find out how much tax he needs to pay. We had a chat with Rushabh and here all the details he shared with us. A PF of Rs 1,200 was deducted by Rushabh’s previous employer. A TDS of Rs 2,000 was also deducted. On his Fixed Deposits a TDS of Rs 1,200 was deducted by the bank. Rushabh purchased a life insurance policy of Rs 50,000 where the sum assured is Rs 4,50,000. Rushabh also has a PPF account in which he contributed Rs 60,000 in December 2014. Rushabh also purchased a health insurance policy and paid a premium of Rs 12,000, since he no longer had a health cover from his employer. Rushabh also purchased an ELSS mutual fund on the advice of a friend by investing Rs 25,000 in January 2015. This is how Rushabh’s tax shall be computed. For purchase of a health insurance policy a maximum deduction of Rs 15,000 can be claimed under section 80D. Therefore, Rushabh can claim the entire premium of Rs 12,000. Rushabh can also claim deduction under section 80TTA for interest on savings bank account of Rs 7,800. Maximum deduction available under this section is Rs 10,000 or interest earned. TDS deducted Rs 2,000 by previous employer and Rs 1,200 by Bank on Fixed Deposit Interest. 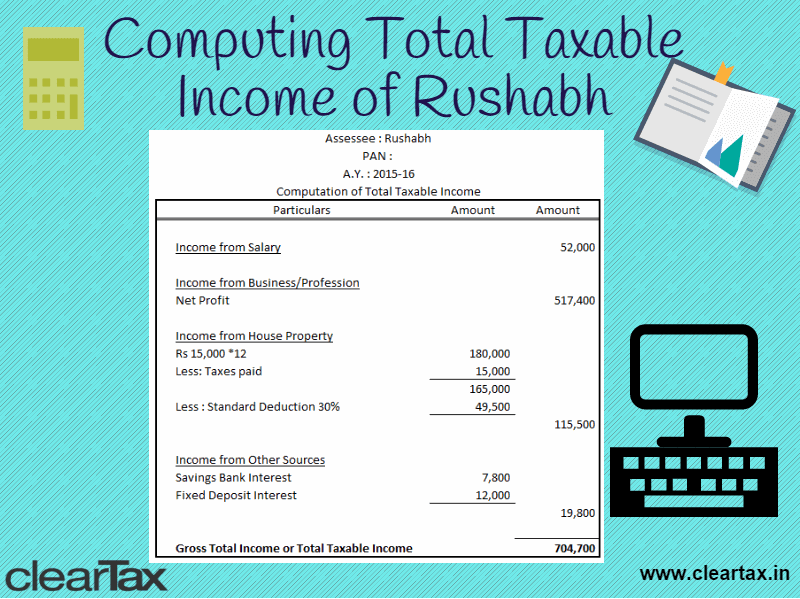 Below is the tax computation for Rushabh. Total tax payable by Rushabh is Rs 32,582. Do note that Rushabh has not paid any advance tax and since his tax liability exceeds Rs 10,000 in one year – Rushabh should have paid advance tax. Since no advance tax has been paid by him interest shall be charged under section 234B and 234C. 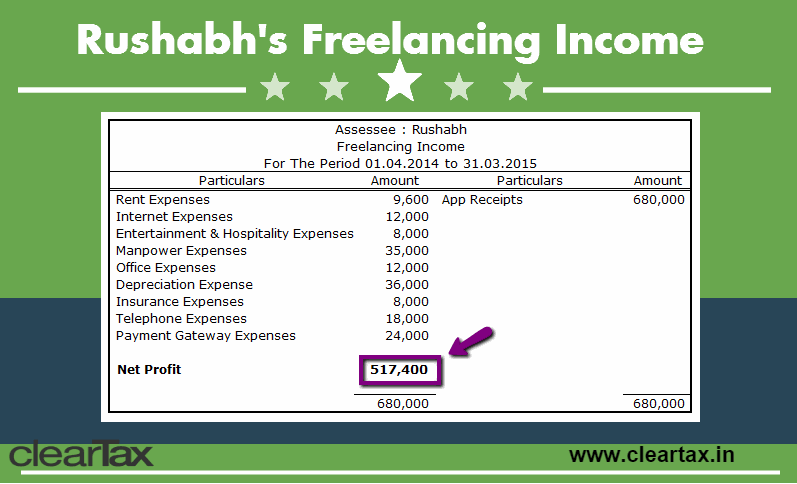 We understood expenses of a Freelancer, and calculated Rushabh’s taxable income. We also helped Rushabh find out total tax payable by him. Rushabh has now understood Income Tax in detail and seeks out one of our CAs to help him file his income tax return. Service Tax – If the total Revenue from freelancing work is Rs 10lakhs or less, Service Tax rules do not apply. However, once you cross Rs 9lakhs in revenue it is mandatory to apply for service tax registration. Also Rushabh is ‘exporting’ most of his services, see revenue details here. Service tax is not applicable when services are exported. Therefore, at this stage service tax is not applicable to Rushabh. VAT- VAT is not applicable in this case since there are no physical goods being sold. TDS – The Indian Payment Gateway charged Rushabh Rs. 24,000 as commission fees in the month of March. Rushabh has made a payment of Rs. 24,000 to the Payment Gateway for its services. According to law, Rushabh has to deduct TDS on this payment. This helped Rushabh understand the taxes applicable to him in detail. One of our CAs helped Rushabh, regarding how to deduct TDS from payments and depositing TDS in a timely manner with the government to avoid penalties. Have questions? Write to us support@cleartax.in. We do hassle free tax –filing for Freelancers.